Browse 88 market data tables and 71 figures spread through 161 pages and in-depth TOC on “Malt Ingredients Market by Type (Dry Extracts, Liquid Extracts, Malt Flour), Source (Barley, Wheat, Rye), Grade (Standard & Specialty), Application (Alcoholic & Non Alcoholic Beverages, Food & Pharmaceutical), & by Region - Global Trends & Forecast to 2020"
This research report includes the market for malt ingredients used in beverage, food, pharmaceutical, and other applications. 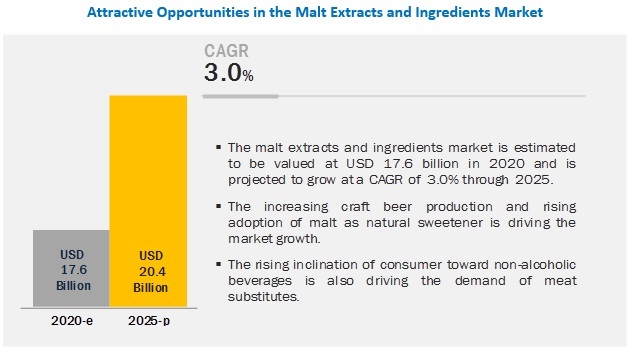 The market for malt ingredients is projected to reach a value of $22.8 Billion by 2020, growing at a CAGR of 6.8% from 2015. Trends such as increasing demand for natural ingredients, clean-label products, and products that boost health and wellness are driving the global malt ingredients market. Malt is one of the major ingredients in the brewing industry, which is a key driver for the market. The European region is one of the leading global producers and consumers of malt ingredients. The malt ingredients market in this region is projected to grow at a CAGR of 7.4% from 2015 to 2020.